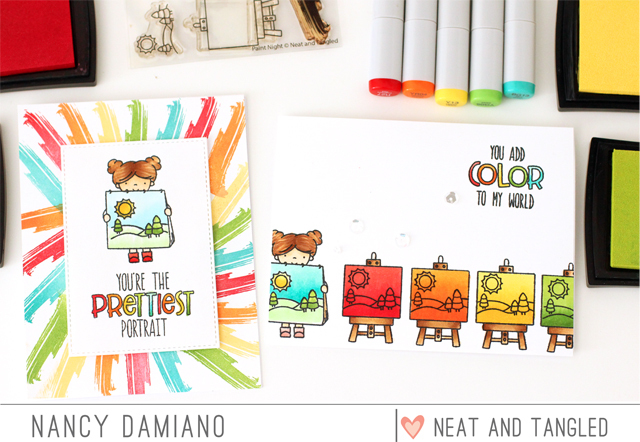 Hey there, welcome to the day one of the May Neat and Tangled release. 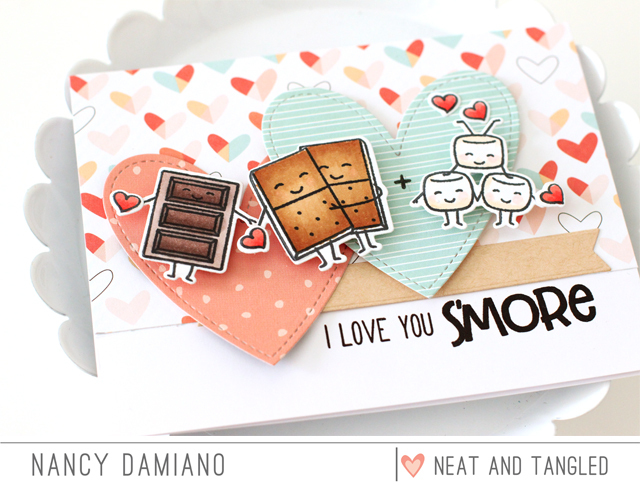 The next stamp set up is called Layered Landscape. It's a beautiful layered stamp that makes for stunning cards. 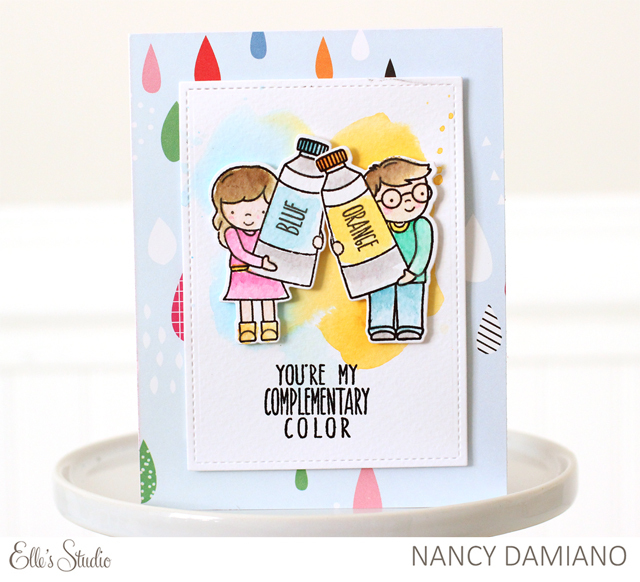 This card was created with pigment inks for a bold wash of color. 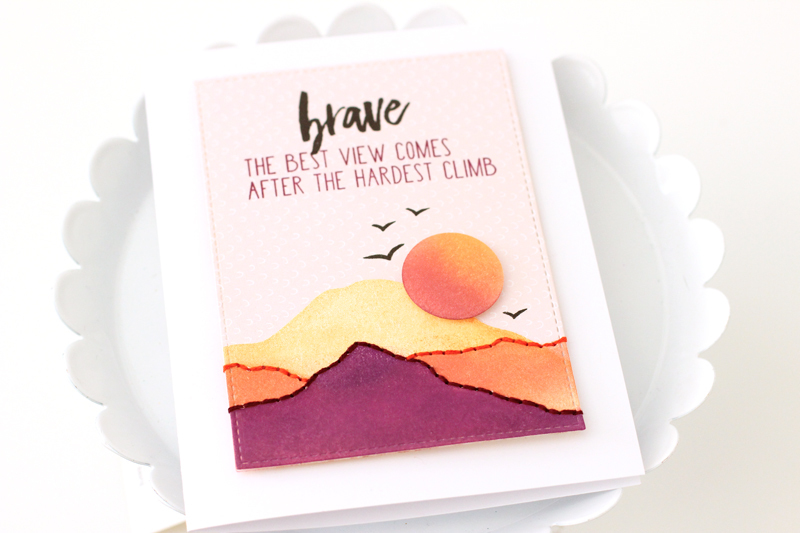 Blending the ink and using a light coral background make for a beautiful sunset! To really make the mountains stand out, I added some hand stitching with embroidery floss. 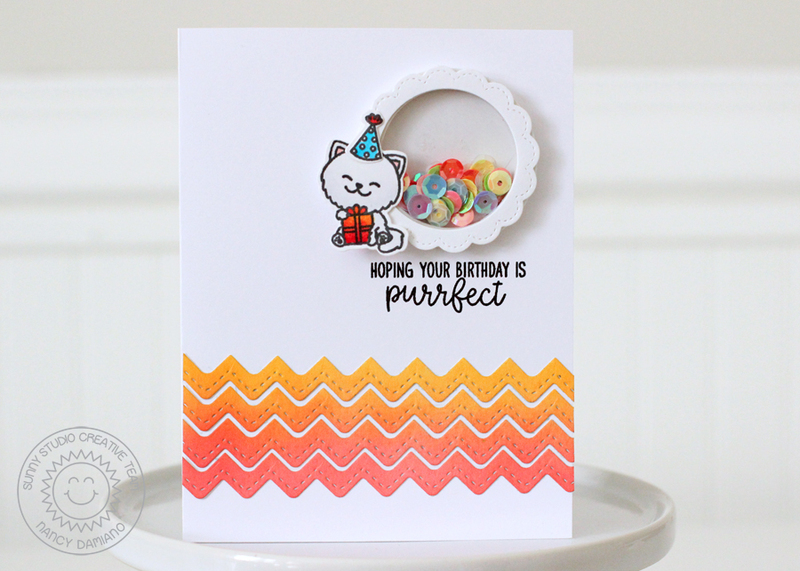 I like the texture and punch of color it lends the design. 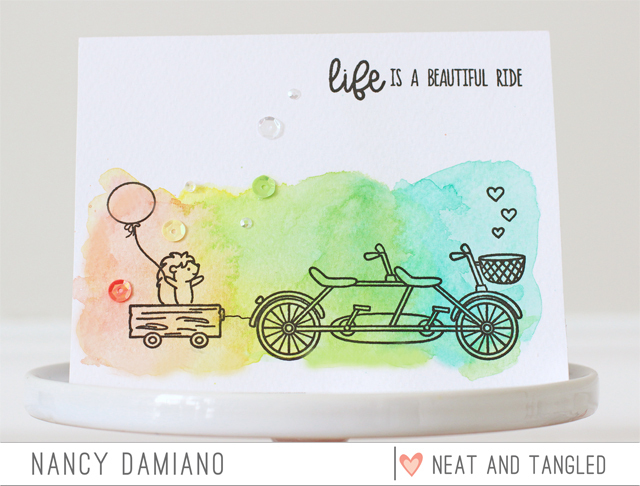 Neat and Tangled will be giving away a Layered Landscape stamp set. To enter, leave a comment below to be entered. 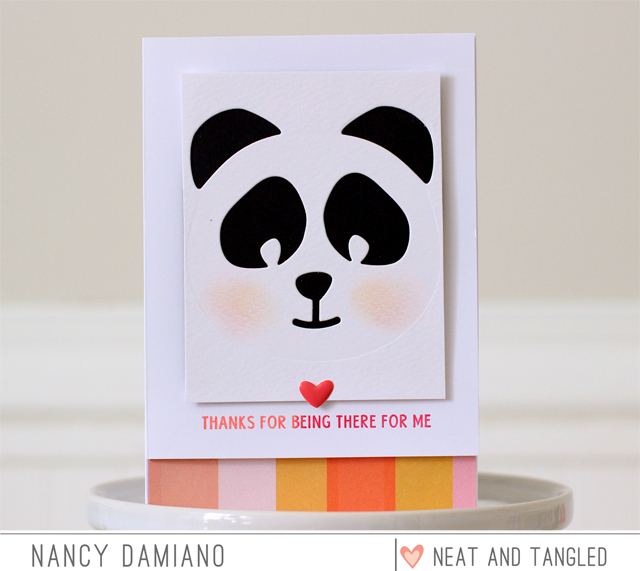 Be sure to visit the Neat and Tangled blog on Friday for a list of winners. Good luck and thanks for stopping by! 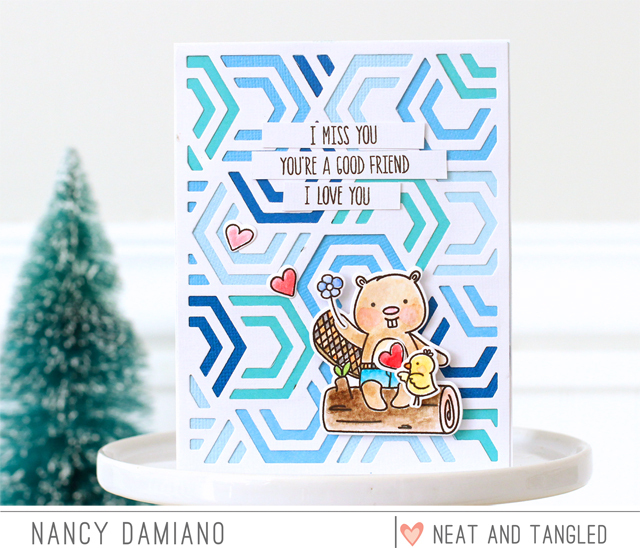 Hey there, welcome to the day three of the March Neat and Tangled release. On the final day of the release, I have monsters! 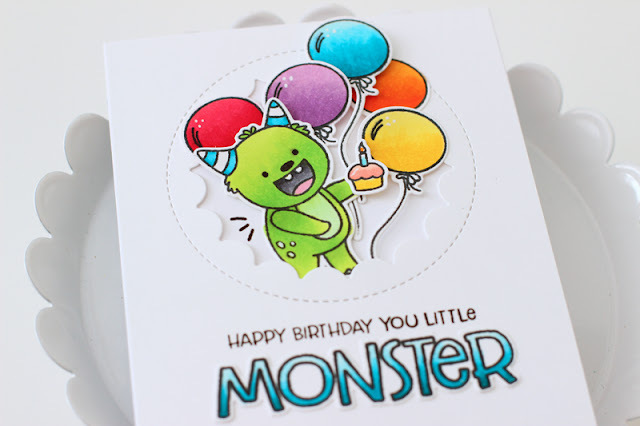 My favorite set from this release includes a tiny birthday monster for all of your celebrations. To create this card begin with a white cardstock card base with a circle die window cut out of it. Next, use Copic markers to color the monster, balloons and title in bold colors. 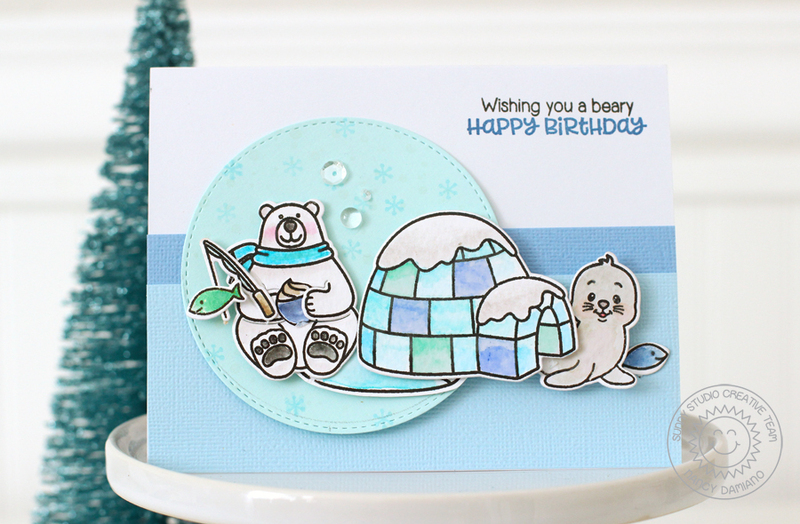 Layer the monster and balloons in the center of the die cut circle, using foam tape to pop up some of the elements. 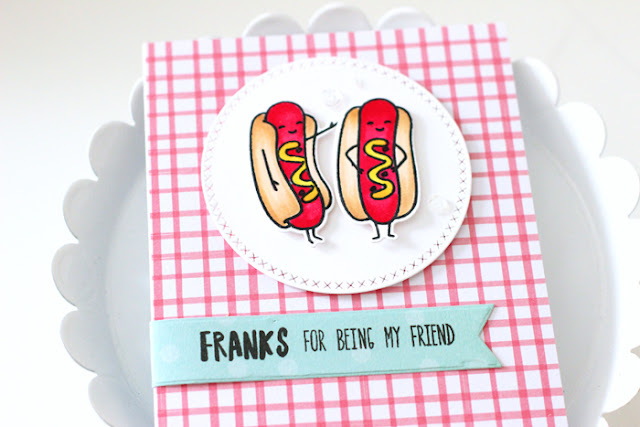 Use black Versafine ink to stamp the subtitle and layer the "monster" title just underneath. 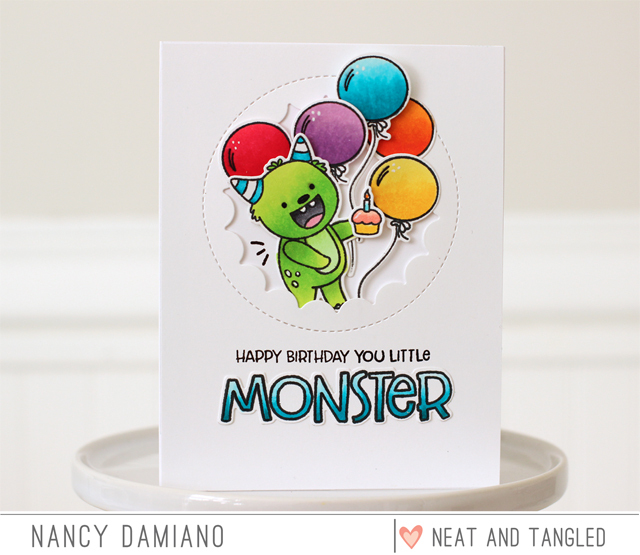 Neat and Tangled will be giving away a Little Monster Stamp Set. 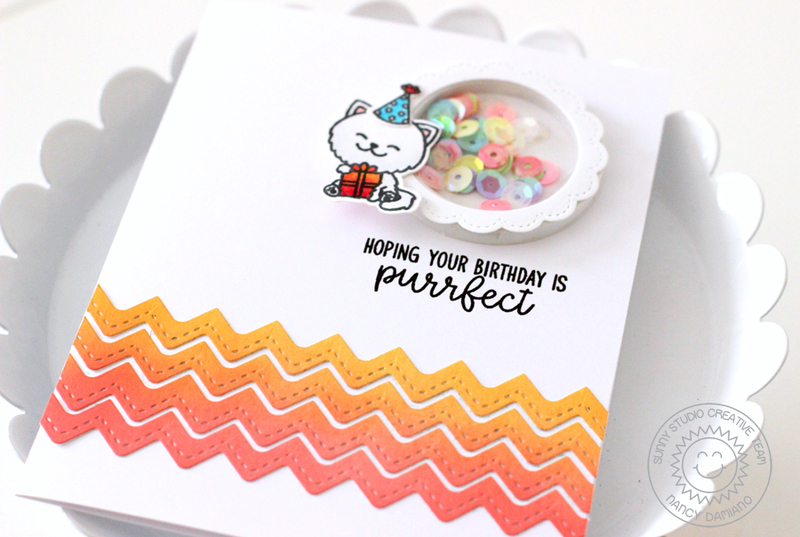 To enter, leave a comment below to be entered. 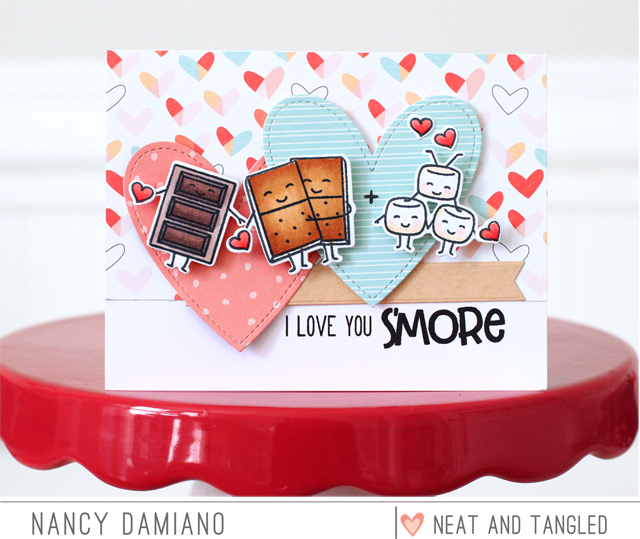 Be sure to visit the Neat and Tangled blog on Friday for a list of winners. Good luck and thanks for stopping by! 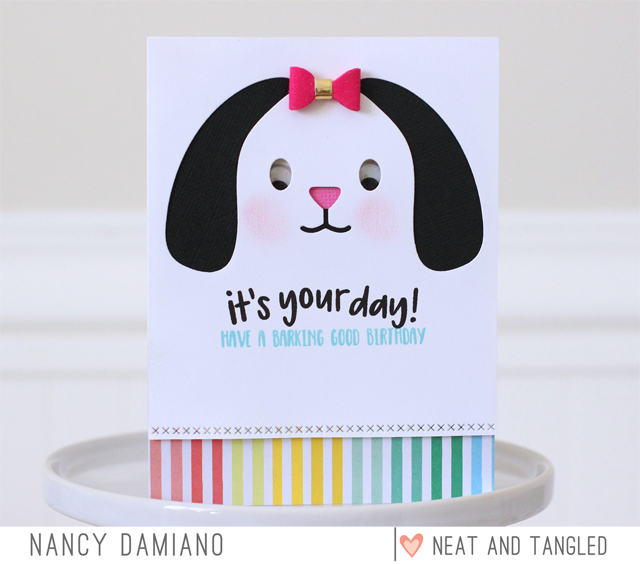 Hey there, welcome to the day two of the March Neat and Tangled release. 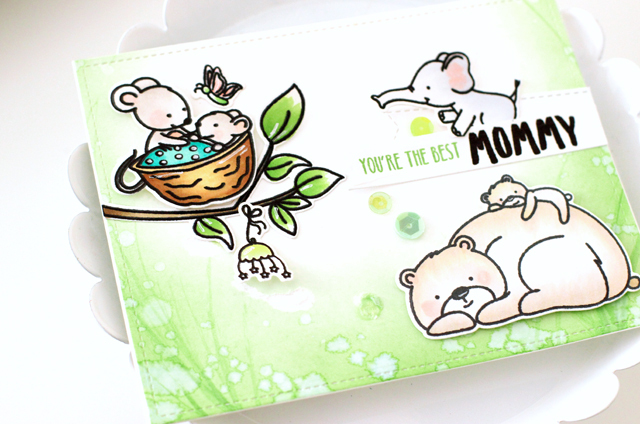 The next stamp set up is called No Words for those times when you need a card for the difficult and sad times in life. 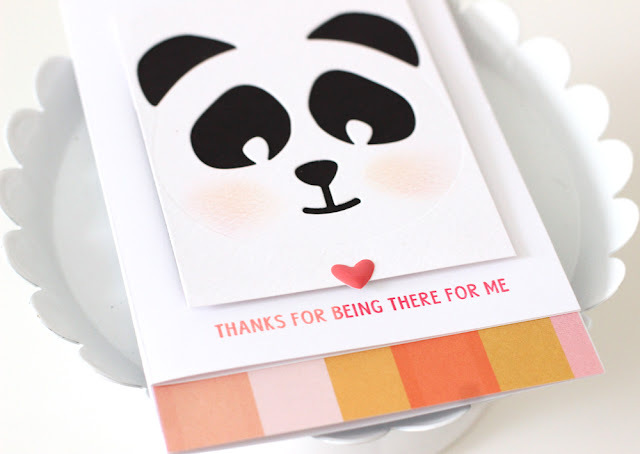 It's a great way to send a hug in an envelope to those you love and are thinking about. 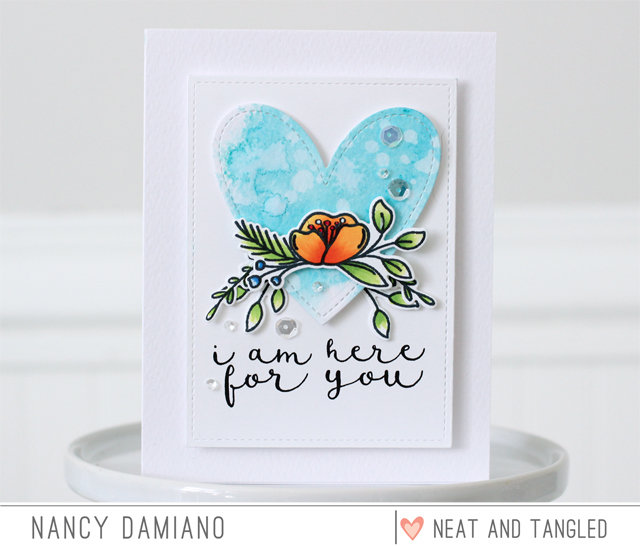 To create this card begin with watercolor paper and a die cut heart. 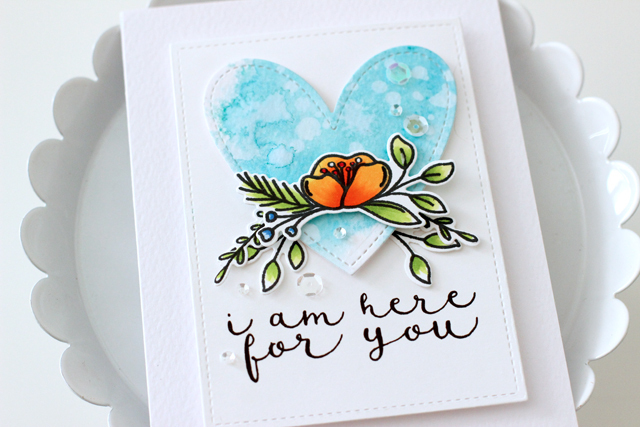 Use Distress Ink in Peacock Blue to add a splash a color to the heart. 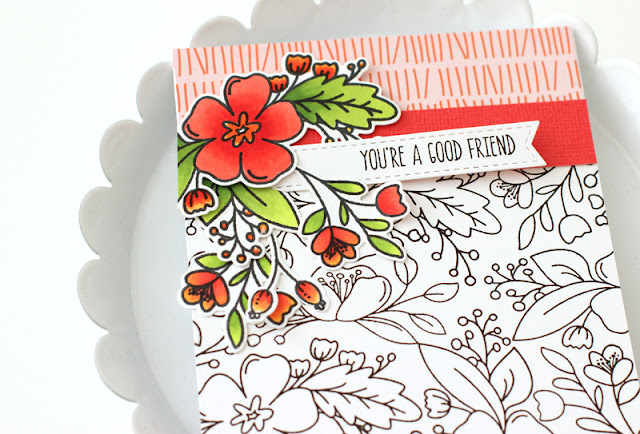 Next, use Copic markers to color a floral spray. 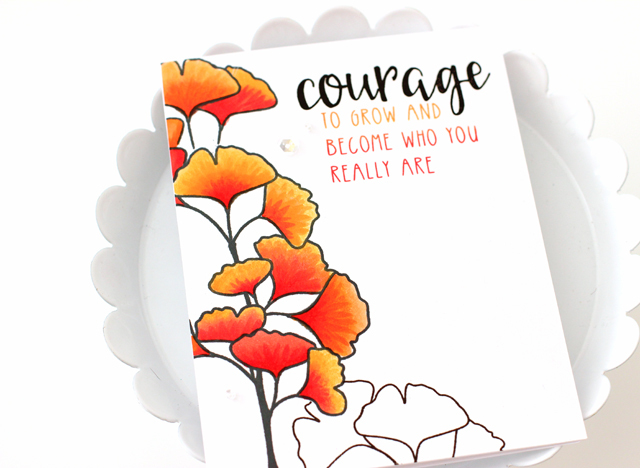 A beautiful script sentiment in black finishes off this clean card design. 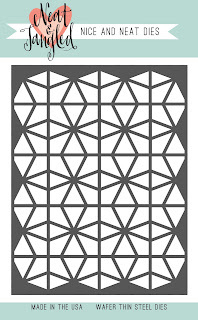 nk. 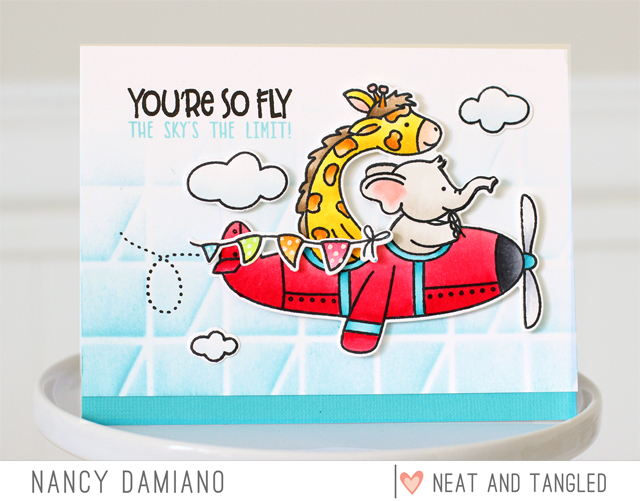 Neat and Tangled will be giving away a No Words stamp set. 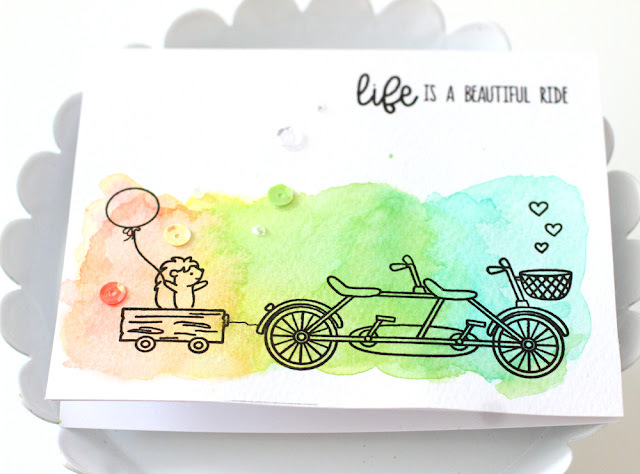 To enter, leave a comment below to be entered. 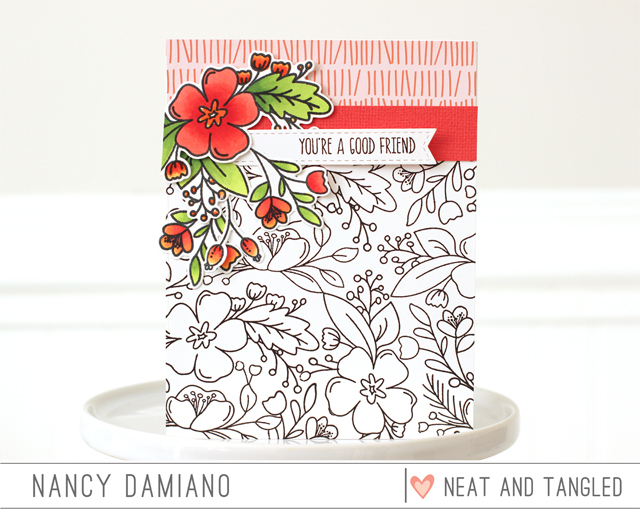 Be sure to visit the Neat and Tangled blog on Friday for a list of winners. 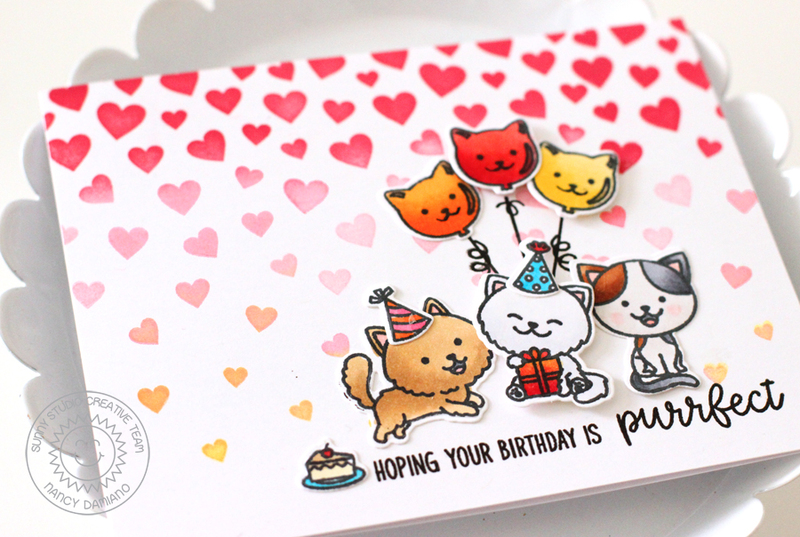 Good luck and thanks for stopping by! 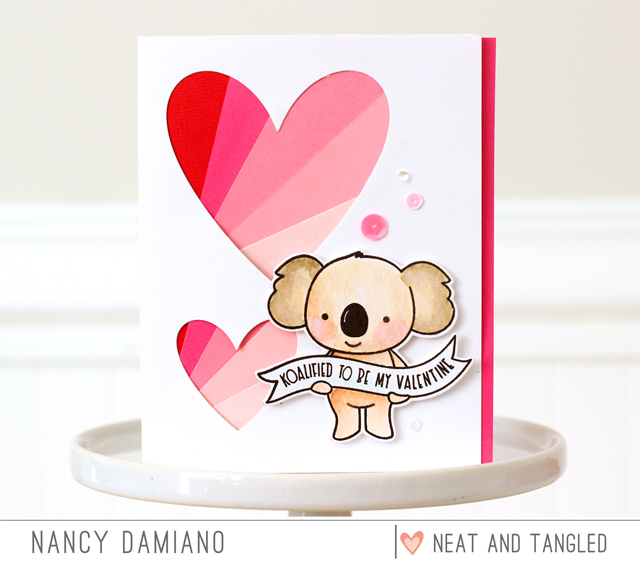 Hey there, welcome to the day one of the March Neat and Tangled release. The first stamp set up is called Hello Spring and it's a beautiful block of words perfect for creating seasonal cards. 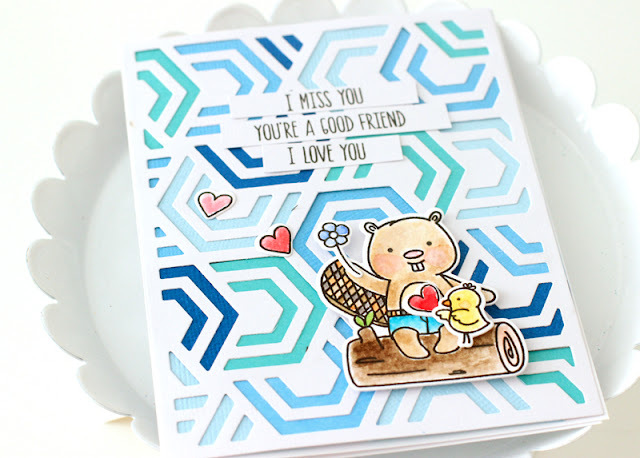 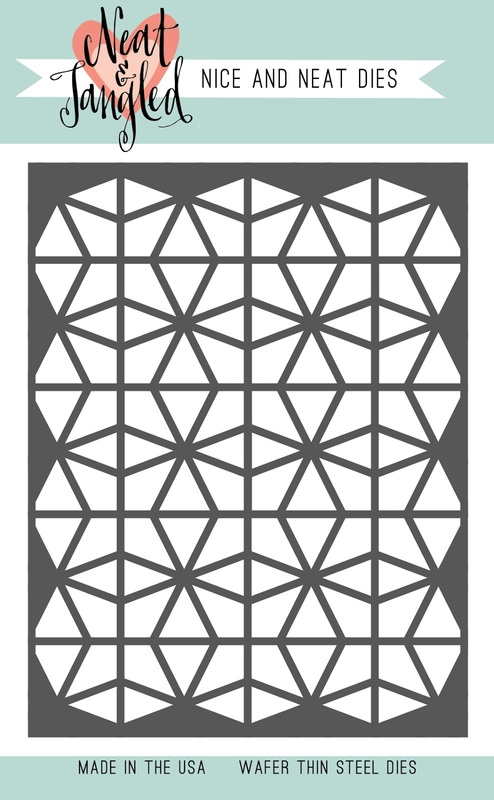 To create this card begin with a die cut window card. 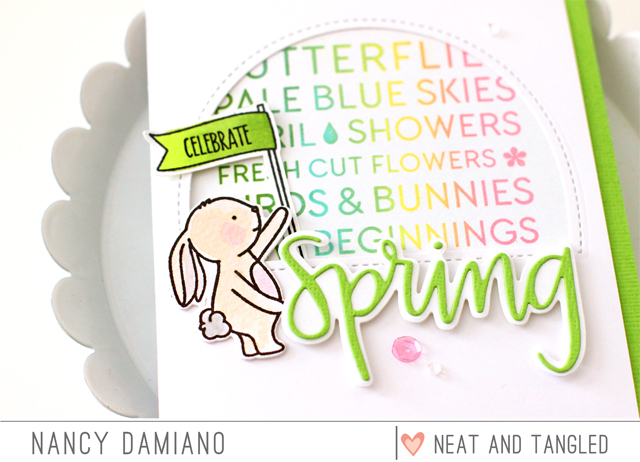 Next, stamp the Hello Spring block text with pigment inks in green, robin's egg blue, yellow and raspberry. 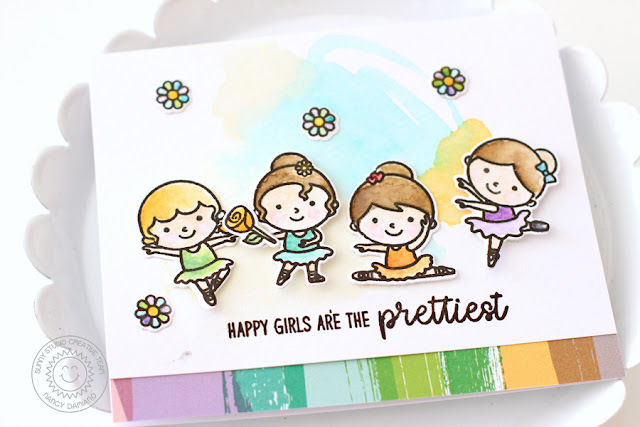 Additional colors will be created as you layer these four. 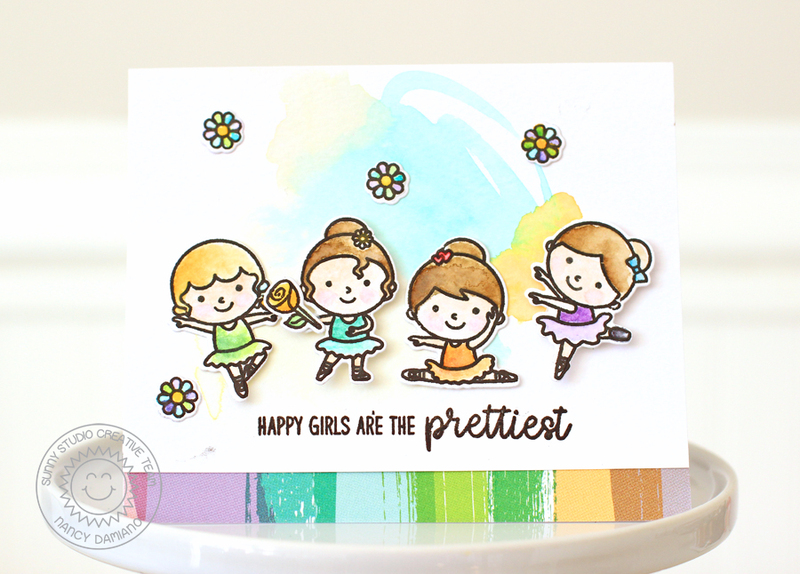 Use a stamping press to make this process easy! 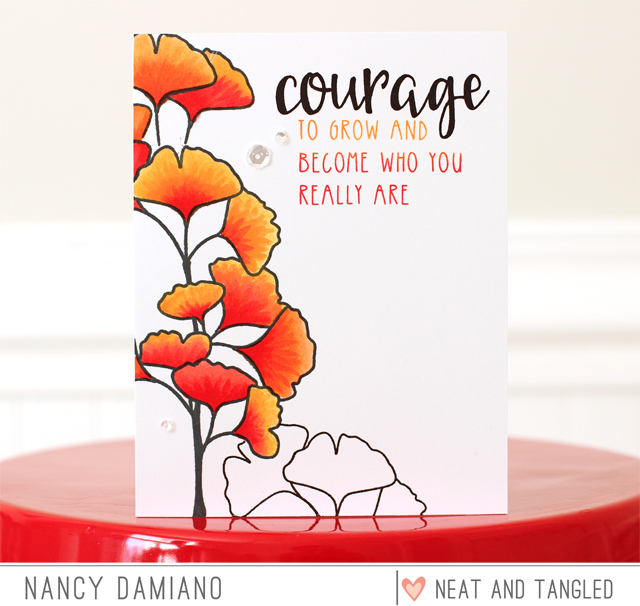 Use the Neat and Tangled Spring die to create a bold title. 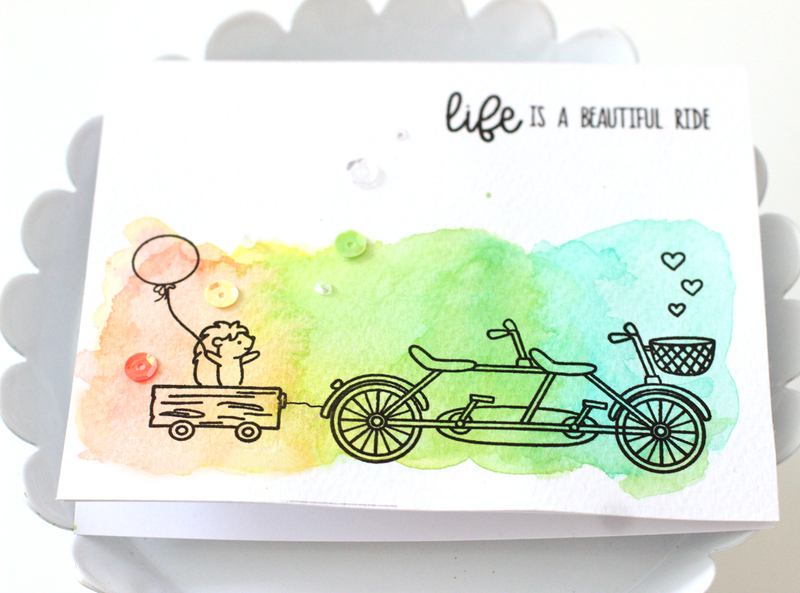 Add a small bunny watercolored with Distress Inks and a flag with a celebrate sentiment. 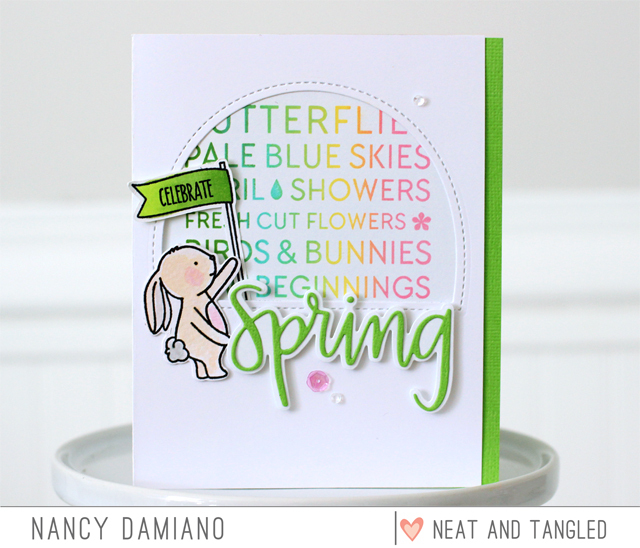 Neat and Tangled will be giving away a Hello Spring stamp set. 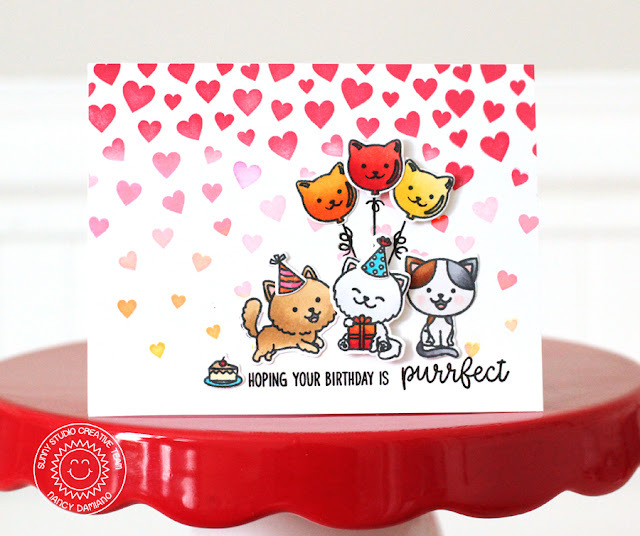 To enter, leave a comment below to be entered. 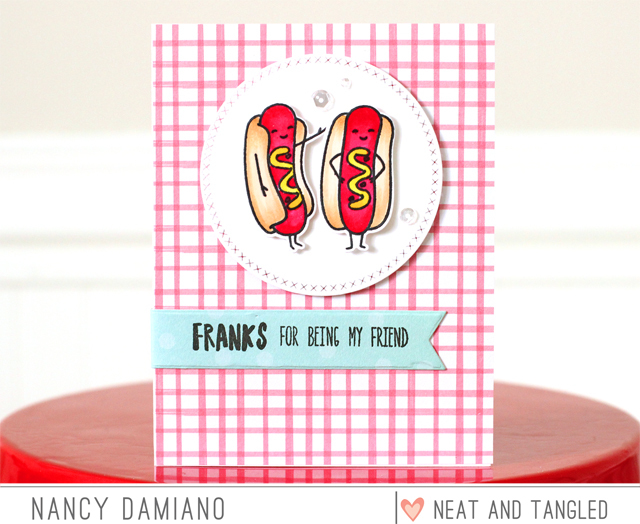 Be sure to visit the Neat and Tangled blog on Friday for a list of winners. 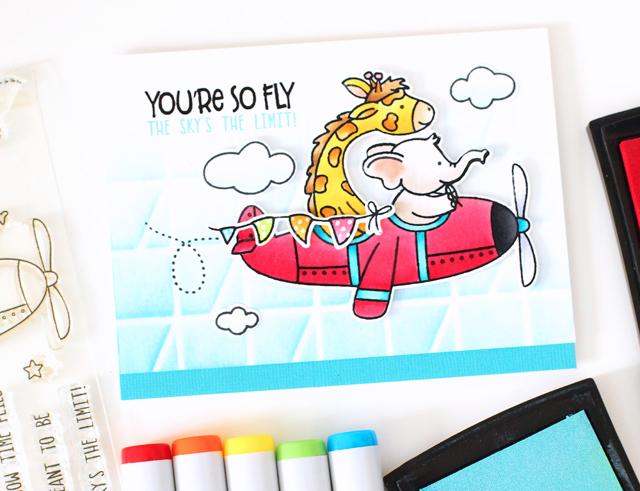 Good luck and thanks for stopping by!